I'm sitting here on the eve of Aulia's second birthday thinking back to when I was pregnant, how much I LOVED being preggy, how anxious I was to meet my daughter, and how scared I was that I wouldn't know how to raise a child. Here I am now about to celebrate my baby girl turning 2. Has it really been 2 years already? All I can say is I am in awe. In awe of how amazing Aulia' is. In awe how comfortable I feel now as a mother. In awe that 2 years have already gone by. In awe of how much I 100% adore my daughter. During the last couple of weeks, I've really taken the time to sit back and enjoy Aulia' and our relationship. 2 years have flown by. I can't imagine how fast the next 15 years are going to be. Before I know it, she'll be sitting for SPM, graduating high school and going off to college and my baby will no longer a baby. Well, I know I'm always going to call her my baby, but our lives will never been as simple as they are right now. Aulia' has really started to blossom into an independent girl. 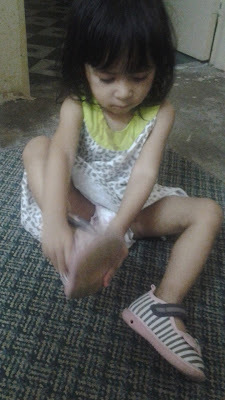 She wants to do so much on her own, yet also want to be just like ibu. She really us my shadow day in and day out, continuously wanting to help me with chores and daily tasks. Whether it be doing the laundry, sweeping, or picking out groceries, she's always eager to help. 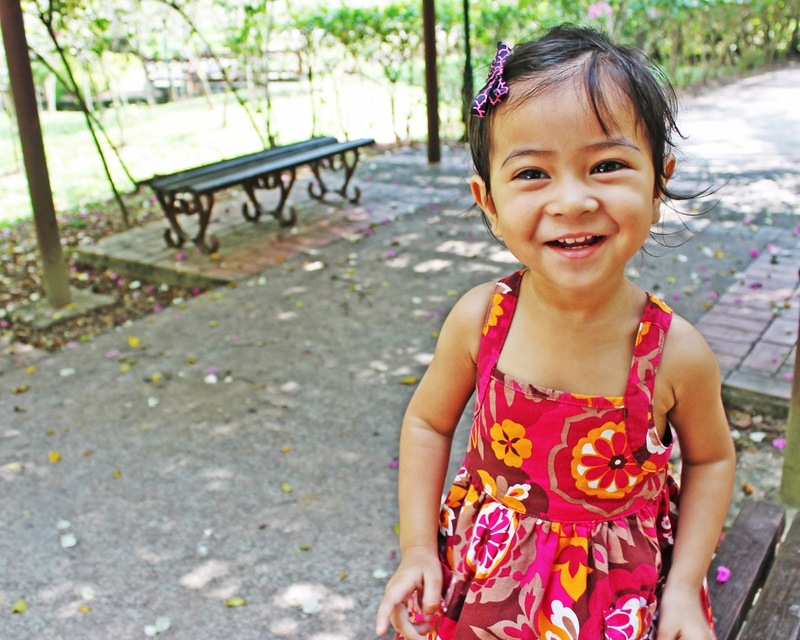 Along with this desire to help, Aulia' is also really starting to become more and more independent. Just the other day I had picked out a pair of shoes for her, which she scoffed at and, instead, asked to wear her Fiffy shoes. This was first! Aulia' picked out her own shoes. I didn't get frustrated but instead welcomed her expressing her own opinion. I was actually so excited that this happened. I want her to feel like she has a say in some things. I will reserve the battles for other more important issues, shoes not being one of them. Aulia' has officially started imaginative play. For awhile now, we've been playing mom and baby bear. She loved when I swing her toy cradle and make her baby bear milk. She's really starting to get more and more into playing baby bear and put her 'babies' to sleep. When I'm making dinner, she loves to bring some food for her 'babies' and pretend to feed them. I always make a big deal about it and act surprised that she made her 'babies' something. It's so important to encourage such play. She loves to bathe her babies, feed them, rock them, etc. I've also noticed when we play together, she's starting to show more and more concern for the well-being of her toys/ babies and along with this me as well. If I hurt myself, she's so concerned and wants to know what happened. I LOVE that she's becoming such a caring, compassionate person. This is one of the most important characteristics to me and love watching her grow in this way. Aulia' and I have been working on quite a lot of skills at home as well. I am so impressed that she can count to 10 before turning 2. This seems like such a huge skill for her to have at such a young age. I could be wrong, but I'm really impressed. We work on colors and the alphabet all the time. She's getting better and starting to memorize some colors and letters. Pink and red seem to be her favourite colors to call out. One thing we've been working on for awhile that I'm most proud of is manners. I love that Aulia' says thank you and she remember to recite du'a every time we had meal. Even before she had breast milk. Lastly, as to be expected, Aulia' vocabulary is booming. I know a lot of this has to do with the fact that I talk to her non-stop and teach her new words. I think it's important to take the time to sit and tell her what things are called. She totally surprised me the other day when she called out Caterpillar correctly in the car. I then noticed that the caterpillar toy was in the car at the dashboard. It's little things like this that truly amaze me. Aulia' is SO smart! Her range of knowledge seems so impressive to me. When we talk, we can have little conversation now and she demonstrates all day long that she comprehends new things she's learning every day. I keep saying it and will say it again. I once thought that a lot happens from birth to one year old, but there's a thousand time more growth from one to two years old. I have absolutely loved all the changes Aulia' has gone through this past year and am excited for all the new experiences the upcoming year holds. I can't say it enough..I'm in complete awe of my baby girl. She is growing up so fast and becoming a truly beautiful girl inside and out. I feel so lucky and blessed to have brought such a wonderful person into the world and can't wait to see what amazing things she's going to do in her life. Happy birthday sweet pea. .Know that Ibu and Papa loves you more than you could ever imagine. Thank you for being such an amazing daughter. Hugs and kisses forever and ever.